Usually when I’m harassing my roommate via text message to pay me back for the pizza and beer I bought her the night before, I have to use another app to request that $519 (we really like pizza). Apple is thinking about offering another option, it seems, with a patent for a system that would allow iMessage users to pay each other from within the messaging app itself, as well as from within other iOS features. Quartz noticed the patent filing published earlier in December, which seems to show that Apple would not only let people send money via iMessage, but in other iOS functions like phone calls, email, and calendar invites. 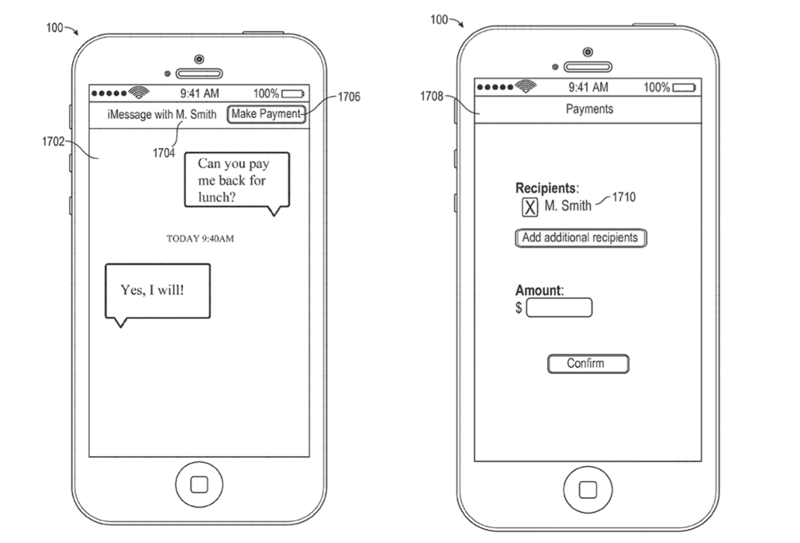 The patent clearly shows how the system might work: two friends are chatting, one asks the other to pony up what they owe, and there’s a “Make Payment” button in the upper right-hand corner that would allow for that to happen, ostensibly using credit card information saved in Apple Pay. While every patent application doesn’t mean a company will definitely follow through, it makes sense that Apple would be exploring ways to grow its mobile payments. Other tech companies are already on that path, as well: in March, Facebook added a payment feature to its Messenger app that allows friends to send money without leaving a conversation.